Offering luxurious rooms feature floor-to-ceiling windows and a rainshower, this Pullman property houses a spa, fitness facilities and an outdoor pool. Situated within the Podomoro City Super Block, it is a 25-minute drive from the Soekarno-Hatta International Airport. Featuring stylish slate grey and red interiors, the spacious rooms offer a flat-screen cable TV, trouser press and a tea/coffee maker. A bathtub, hairdryer and toiletries are provided. 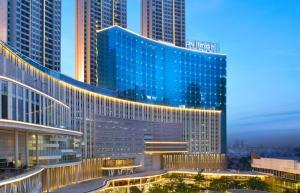 Pullman Jakarta Central Park is 6 km from the National Monument and 22 km from the Taman Mini Indonesia theme park. It is about 13 km from Gambir Railway Station and Ancol Theme Park. Guests can relax with a massage at the spa or use the sauna and hot tub available. They can also head to the rooftop garden. Added conveniences include a business centre, concierge services and free parking. Featuring daily buffet breakfast, Collage offers live cooking stations and all-day dining. The hotel also has a tapas bar and 24-hour room service.